Thanksgiving time is here, and I’m ready to dive into my favorite foods and desserts. As far as I’m concerned, the holiday isn’t complete without green bean casserole and a dark chocolate pecan pie! While I’m always thankful for delicious meals at this time of year, I am even more thankful for friends and family. For me and for many others involved in education and teaching, family includes the students and parents that make up such a large part of our lives. 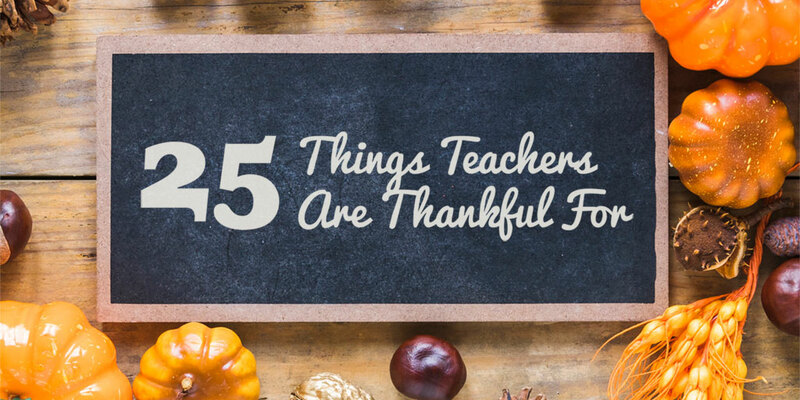 In the spirit of the upcoming holiday, here is a list of things to be thankful for when it comes to teaching and guiding students, which we have collected from educators and administrators. Hardworking teachers who are willing to do whatever it takes for their kids. Eyes that light up with success. Helping mold young adults into environmentally literate citizens who can choose to make sustainable choices in their future. Hug attacks from former students in the hallways, recess, and lunch room. Planning the perfect lesson—and it going exactly the way I imagined it would! Seeing my students around town or at games. Amazing co-workers who challenge and extend my ideas. Administration that supports and encourages growth. Experiencing students’ excitement when we work on collaborative projects, meet with other schools across the country, and partake in video conference sessions with museums and organizations. Learning something new with technology. Seeing my students engaged with all the new technology in the classroom and having fun as they learn. Having students who are excited about learning. Having classroom technology that rocks. Getting planning time during the school day. Finding money in the budget for purchasing needs AND wants. Having a candy stash in my desk, which is shared with students on good days, and is just for me on bad days. Having the opportunity to empower my students with lifelong learning skills. Being around students who laugh at my jokes. Being able to do many different things in one day. Being challenged to figure out how I’m going to do a project when there is no money. It makes me VERY creative! Meeting and sharing stories about the little ones with caring parents. Hopefully you enjoyed reading this list as much as we enjoyed putting it together. Please comment below with your notes of thanks, and have a Happy Thanksgiving!